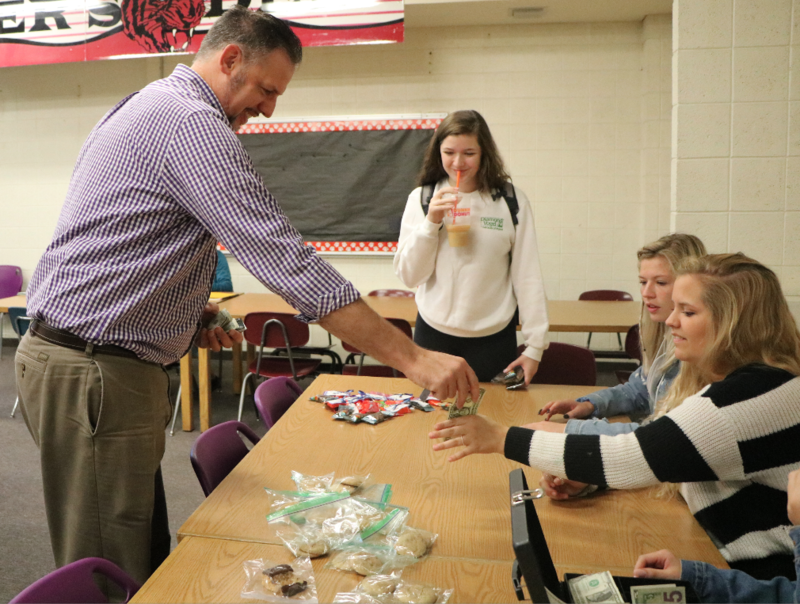 English teacher Matt Klemesrud makes a contribution to the food drive on Oct. 4 by participating in one of the regular bake sales scheduled at the end of each week. The high school is wrapping up the second week of the food drive, and there are still many opportunities for raising money and donating non-perishables for the food pantry in the Northeast Iowa Food Bank, which provides nutritious food for 240 households year round. The Mobile Food Pantry provides food to an average of 80 families per month. Barbara Prather, the executive director of the Northeast Iowa Food Bank, has been a part of the food bank since 1999. “At the end of the day, feeding others is what’s important,” Prather said. When students donate money, the people working at the food bank can get better deals on food, and the extra money makes it easier to distribute goods across Black Hawk County. “We are sponsored by many companies, so it’s easier to have money at our disposal to spend on more food,” she said. As before, all Cedar Falls schools are participating in the drive, and the high school is competing with Waterloo East High School and Waterloo West High Schools to raise the most donations. On Monday, Oct. 22 a powder puff volleyball tournament is also planned, and to participate teams need to bring a donation of $5 or two jars of peanut butter. Sophomore leadership member Mandi Warren said she is going to participate in trunk or treat on Sunday Oct. 28 in the back parking lot. “I personally love to talk to little kids and see all their cool costumes,” Warren said, as well as that she enjoys the feeling of giving back to others and the fact that she gets to have fun for a good cause. Trunk or Treat is a fundraiser where kids can come dressed up and trick or treat in a parking lot. Lots of the “trunks” the kids go trick or treating in are made by the sophomore, junior and senior leadership groups. The families have the opportunity to donate for the food drive as they participate in the trick or treating. Spanish teacher Katie Llerena said that the bake sale is her favorite part of the food drive. “They are really good and helps a good cause,” Llerena said. The bake sales are a weekly fundraising opportunity with a sweet treat as a reward. The sales happen on Thursday and Friday mornings before school. Last week the senior leadership group had $3 Chick-Fil-A breakfast sandwiches that were donated to the fundraiser. Another way that any student can get involved with the food bank is volunteering. To be a volunteer a person needs to apply online and attend an orientation before they can help package food. The volunteer option can be something a person can do by themselves or it can be something they can do with a group of up to 20 people. Prather said starting a community garden is another cost effective way of donating food to the food pantry and helping stop hunger in Black Hawk County. What Barbara Prather wants students to know is that their donations are making a difference.